Last week the market kicked off for the season with full force and we expected week 2 to be a little lacklustre in comparison. But no, the Australian Dollar plunged, the auction price peaked and those with the patience to hold on past the first week came out grinning. All forces lined up to lift prices right across the wool market. The EMI broke into the record books, rallying 64¢ for the week to an all-time high of 1614¢ in A$ terms. In the West, the indicator finished at 1680¢, up 74¢ (Figure 1). The record prices seen on the auction floor largely have movements in the Australian dollar to thank. Earlier in the week the dollar plunged down to the low 78US¢ region, hitting the lowest level we’ve seen in the last month. This encouraged strong demand on the export side with offshore buyers making the most of the low foreign conversion rate before the currency rallied again toward the weeks’ end. In US dollar terms, the EMI finished 60¢ higher, a substantial 28% gain on this time last year. It was on Thursday that the market really jumped, with demand clearly exceeding supply. Pressure was particularly high in the 21 to 23-micron range in the East. The 21micron reaching 1668¢ in the North and 1663¢ in the South. 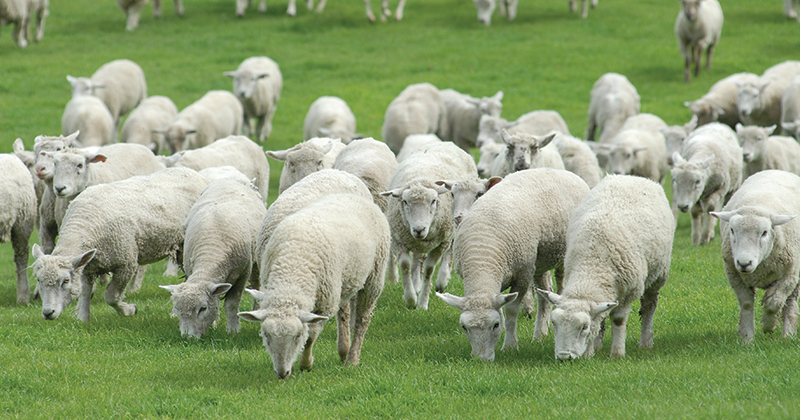 Demand for fine wool broadened out between the Northern and Southern markets. 16.5 MPG saw a real win in the South, receiving a 118¢ rise on the week. This was only outshone by the 18.5 micron in the West which gained 120¢ to 2081¢. As anticipated, volumes leveled down this week after the post recess splurge (Figure 2). 39,126 bales were offered up across the nation with just 2% pass in rate owing to the drop in supply since last week. To compare with this time last year, volumes being pushed out to market are still considerably higher. Anecdotal evidence from brokers is suggesting that demand at these levels might be a petering point for mid fibres wools, particularly with the A$ regaining some value again. The chance for similar magnitude gains as experienced this week is probably slim in the coming few weeks. Particularly so, if the Australian dollar remains around its current levels and slows down orders from overseas. The offerings will continue to decline next week with Fremantle on break. 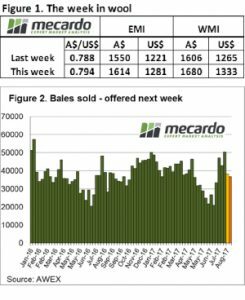 Sydney and Melbourne are both selling but on a Tuesday and Wednesday roster due to Wool Week with 36,888 bales on offer.